You turn on the hot water faucet, wait for the water to heat up, and after almost a minute, it’s still running cold. Maybe you stepped into a nice, hot shower, but the water gets cold within just a few minutes and ruins your nice relaxing shower. Unfortunately, these are pretty common problems that many homeowners or apartment dwellers might face eventually, especially with electric water heaters and water heater reset switches. What’s the Problem? Why Does the Switch Keep Tripping? What is the High-limit Switch? The first thing you should check is the water heater’s reset switch, which is usually a red button on the upper thermostat of an electric water heater (you will need to remove the small panel to access it). If the button is lit up, it means the switch tripped and needs to be reset. You reset the electric water heater reset button by pushing that red button. There may also be a lower thermostat reset button on the water heater. If so, push that reset button as well. If you push either of these buttons but they immediately trip and won’t reset, you may have a problem with one of the parts in the water heater. One of the main causes for the reset switch to trip is because the water heater is actually letting the water get too hot. This is probably an indication of a faulty thermostat in either the upper or lower heating element. The way a water heater works is pretty simple. Water in the pressurized tank fills from the bottom up and heats from the bottom up as well. Fresh water fills at the bottom and the lower heating element heats that water. As the water fills to the top, the upper heating element keeps the water hot. Each section has its own heating element and thermostat. These thermostats control the heating elements in the water heater. As the water sits in the tank, it will start to cool off. The thermostats kick in to reheat the water. Once the water heats to the temperature set on the high-limit switch, the thermostats shut off. If the lower heating element or thermostat goes bad, the water won’t heat up at the bottom. So as you use the hot water that’s at the top of the tank, it’s replaced by the cold water the bottom of the tank. If the upper heating element or thermostat goes bad, you may get hot water at first, but you’ll quickly use up that hot water before the heated water at the bottom reaches the top. With a faulty high-limit thermostat, the element will keep heating the water above the set temperature and the high-limit switch will trip. The high-limit thermostat should be set at a temperature that gives you nice, hot water, but not boiling water that can burn or scald you. Your tap water should never come out as hot as boiling water. Once you set the thermostat, the water should never heat above that set temperature. If it does, the high-limit switch will trip and the upper heating element will shut off. 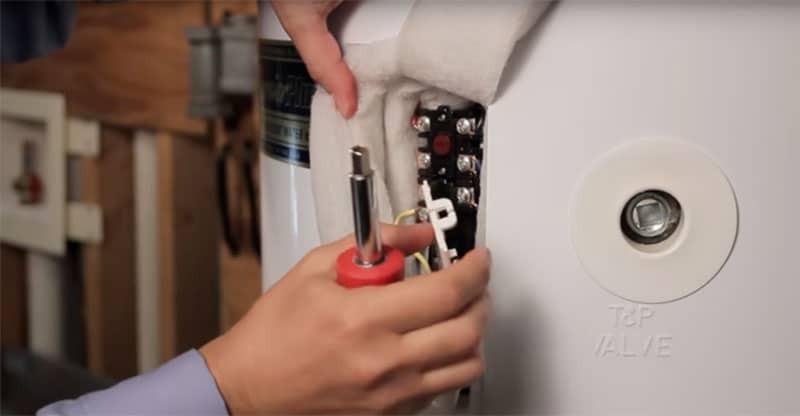 Thermostats aren’t the only parts on an electric water heater that can wear out and trip the reset button, especially if you’re finding you have to reset the water heater frequently or you run out of hot water fast and often. The high-limit switch is bad. If the high-limit switch starts malfunctioning and overheating the water, the switch will trip. Wiring is loose. A loose wire in heating element can cause heat that will trip the high-limit switch. You have a short in the heating element. If this happens, the thermostat may still work correctly, but the short will continue to heat the water beyond the correct temperature and trip the high-limit switch. Lastly, it might not be the water heater at all, but rather how the electricity is set up in your home. If your circuit breaker trips and needs to be reset, the water heater stops getting electricity to run. If the water heater keeps tripping the circuit breaker, you should get a professional in to check the water heater and the circuit breakers themselves to make sure there aren’t any other electrical appliances sharing that same breaker. When i check the power, I light a test light on all terminals but no heat. Not necessary if it’s working fine. Where is the heater normally located in an apartment? This can depend on the building size. Most apartments (1-4 stories) will have an individual water heater for each apartment. They’re usually located in a small closet or they share a larger closet with a washer/dryer unit. Some larger complexes will use large commercial water heaters or boilers to serve the entire building. These can be located in one central location or in a closet/room on each floor.